Grants and loans to state and local governmental authorities to help them provide mass transportation service planned, designed, and carried out to meet the special needs of elderly individuals and individuals with disabilities. 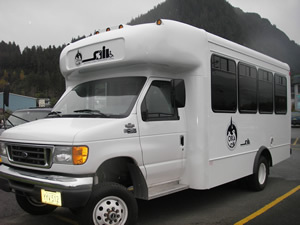 The Alaska Mental Health Trust Authority funds each year the Coordinated/Non-coordinated Transportation Program for the benefit of all the beneficiaries identified by the Trust Board of Directors, which includes those with mental illness, developmental disabilities, Alzheimer’s and other dementias, chronic alcoholism, and traumatic brain injury. The Job Access and Reverse Commute (JARC) program was a formula grant program for projects that improve access to employment-related transportation services for welfare recipients and eligible low-income individuals, and that transport residents of urbanized and rural areas to suburban employment opportunities. Job Access and Reverse Commute activites are eligible for funding under FTA's Urbanized Area Formula Grants (Section 5307) and the Formula Grants for Rural Areas (Section 5311) programs. The New Freedom program was a formula grant program that provided funding for capital and operating expenses that support new public transportation services beyond those required by the Americans with Disabilities Act of 1990 (ADA) and new public transportation alternatives beyond those required by the ADA, designed to assist individuals with disabilities with accessing transportation services. New Freedom activities are eligible for funding under FTA's Enhanced Mobility for Seniors and Individuals with Disabilities (Section 5310) program.